Although his efforts ultimately produced a government crisis in London, Roosevelt was unable to exert a decisive influence on British policy in 1937–8. He failed to coordinate an appeasement plan with Chamberlain as he had originally hoped. Offner blames isolationism for this failure, arguing that the President was asking London to place vital British interest in the hands of a power which itself emphasised lack of interest in political questions.1 This was certainly a major weakness in American peace plans. 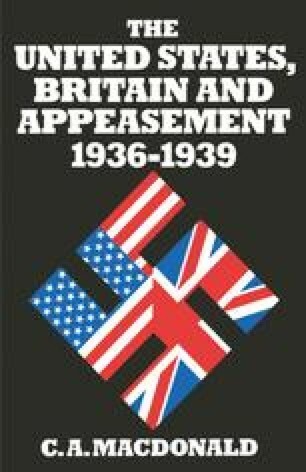 Although Britain would have to make the main sacrifices in any European settlement and had most to lose if appeasement failed, Chamberlain was being asked to accept American leadership and American timing. He was being offered little in return except an economic contribution to a peace settlement. Had Roosevelt been prepared to go further and underwrite a new European security system to replace Locarno, an initiative might have been more welcome in London. As matters stood the President was asking too much and offering too little. He hoped to achieve such ambitious goals as world peace and free trade through moral force rather than hard political bargaining. In retrospect his plans seem rather naive. In 1919 Wilson had recognised that the United States must guarantee a European settlement if its other aims were to be realised. Roosevelt was unable and probably unwilling to undertake such a commitment.